Follow us on the following social media . Childhood obesity is a reality. A South African survey reported that 18.1% of children between the ages of two and five years are overweight – that is almost one in every five! Being overweight or obese at a young age puts children at a greater risk of developing chronic diseases such as diabetes, high blood pressure, high cholesterol and heart disease. It can also result in low self-esteem, a poor body image and an unhealthy relationship with food. In most cases, childhood obesity is preventable. Encourage kids to be physically active – play with them in the yard, take them to the park or go on a family hike. Limit screen time – keep time in front of the TV or computer to a minimum as this promotes a sedentary lifestyle. Kids are also more likely to reach for unhealthy snacks when in front of a screen. Don’t put too much emphasis on weight – focusing too much on body image and weight can be detrimental so rather focus on creating a healthy relationship with food and eating. Pack healthy snacks and lunchboxes – kids spend most of their day at school so make sure to plan ahead and pack a healthy lunchbox. 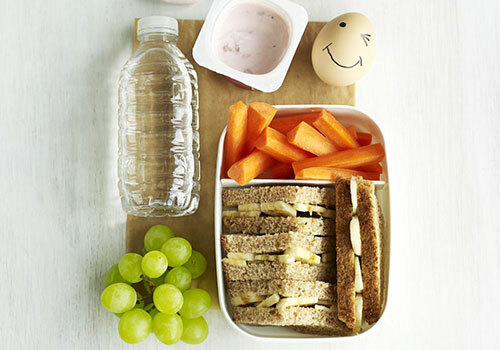 Ideally, lunchboxes should contain all of the food groups – fruit, dairy, lean protein, high fibre carbohydrates, healthy fats and a bottle of water. Set a good example – Children look up to their parents. Try not to make any negative body remarks about yourself or someone else and make sure to set a good example when it comes to healthy eating and meal times. Children won’t eat vegetables if you don’t. Encourage the intake of regular small meals and healthy snacks. Encourage the intake of fruit and vegetables every day. Increase the intake of legumes (beans, peas, lentils, chickpeas) as they provide energy, protein and fibre. Limit the intake of foods high in salt and salty snacks (chips, processed meat, processed cheese). Encourage the intake of water. Water should be children’s beverage of choice, especially when thirsty. Limit the intake of sugary drinks (fruit juice, fizzy drinks, ice tea). Try to include a variety of high-fibre foods in the diet such as whole grain cereals, whole wheat pasta, brown rice, whole wheat / brown bread, legumes, fresh fruit and vegetables. Make food fun and encourage children to help out in the kitchen. This way they will become more aware of different types of food and they may be more inclined to try something new if they helped with preparation. Please share this post via .